Need an Electrician in Vancouver? WireChief Electric Ltd. provides outstanding residential & commercial electrical services by a team of qualified and experienced electricians in Vancouver BC, North & West Vancouver, Burnaby, New Westminster, Coquitlam, Port Moody, Port Coquitlam, Richmond, Surrey. 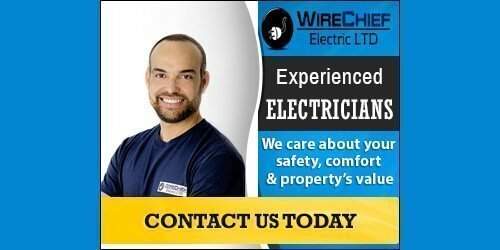 WireChief Electric Ltd. is committed to total quality in all our electrical installations, lighting installations, electrical home renovations, knob and tube wiring replacement, residential electrical services & repairs and commercial work. New homes or new additions require new wiring. We have the knowledge to ensure that your project is properly wired and to the highest safety standards in the industry. All material and workmanship is top quality and will provide years of problem-free operation. Many electricians will wire a home just to minimum code compliance which will work on a tight budget and safely power a home, but we go further and work with the homeowner to ensure there is adequate lighting to complement the home and outlets located in the most convenient places. We work with lighting designers and the general contractor, builder or project manager to refine the lighting layout, accessible switching, and proper placement. We offer a turnkey service when wiring a new home or addition, in that all permits, drawings, design, and fixtures can be supplied by WireChief Electric Ltd. and a complete estimate of all the costs before starting the project. Our Vancouver Electricians are fast, clean, and professionals, so there is no waste of time on finishing your new home. What is the age of your home and is the service original equipment? If you home was built up before 1970 and has not had a service upgrade then it is probably time to upgrade. Are you adding on or remodeling? If you are adding a room or remodeling – finishing your basemant or kitchen you should look to see if there are any open spaces or breakers in your breaker panel to supply power to the new circuits you will be adding. Most kitchen remodels entail adding new lights or appliances that may require more power to run than what you are replacing. Do you have fuses instead of circuit breakers? Fuses are an effective way of protecting wiring from over current or overloading the circuit, but may not protect against faults to ground or may not be sized properly for the old wires that are connected to them. Circuit breakers are more likely to trip in case of a fault or overload and can be rest if this does occur. Keep in mind that fuse boxes were outdated in the early 1960s, so that means the wiring in your home is at least 50 years old and should be replaced or at least inspected by a professional vancouver electrician. The electrical service panel is the heart of your home and should be inspected and in good working order to protect your home and family from fire and or electrical shock. If you have any questions about the condition of your electrical system please call WireChief Electric Ltd. for an assessment. Maintaining your homes electrical system is something most people only do when they are selling or buying a home. Like any of the other mechanical system in a house, the electrical system should also be maintained. There are ways to test or inspect all of the devices in your home to ensure a problem does not occur such as testing the ground fault circuit interrupter outlets that you have in your bathroom and kitchen. This is as easy as pushing the test button on the out let and resetting it. If pushing the test button does not turn off the power at the receptacle or will not rest, then it is time to replace the outlet. Checking the connections in the breaker panel for the proper torque is also important. Loose connections in any electrical system can cause heat, sparks and loss of power. Regular outlets that you have in your home can be tested for proper wiring and the amount of pressure it takes to plug something into them. Believe it or not, there is a specific amount of force given by the UL (underwriter laboratories) that it should take to plug into an outlet. If this force is too little, then you have a loose connection between the cord and plug and the receptacle must be replaced.